LATVIA IS A SMALL COUNTRY ON THE EAST COAST OF THE BALTIC SEA, WHOSE ARTISTS HAVE ALWAYS BEEN HIGHLY APPRECIATED IN EUROPE, ESPECIALLY DURING THE WORLD PARIS FAIRS OF THE EARLY TWENTIETH CENTURY. AND, RECENTLY, THE WORKS OF FAMOUS LATVIAN PAINTERS HAVE BEEN BROUGHT TO MONTREUX! 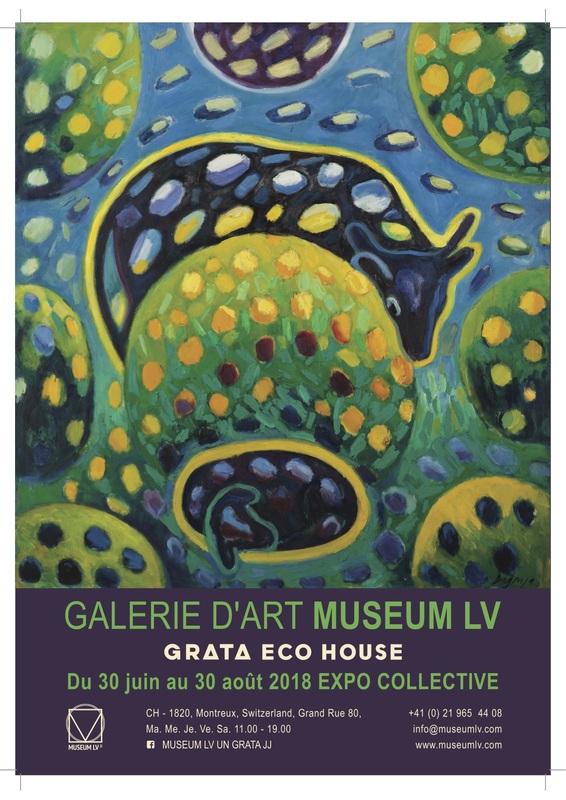 THE LATVIAN CULTURAL CENTRE GRATA JJ AND THE MUSEUMLV GALLERY, IN ASSOCIATION WITH THE SWISS COMPANY GRATA ECO HOUSE SUISSE HAVE OPENED A PERMANENT EXHIBITION AND SALE OF WORKS OF ART BY CONTEMPORARY LATVIAN PAINTERS IN THE HEART OF THE CITY. THE EXHIBITION IS LOCATED ON THE LAKE GENEVA BANKS, NEXT TO THE STRAVINSKY HALL: GRAND-RUE 80, CH-1820, MONTREUX. THIS COLLECTION IS A PART OF A LARGE-SCALE INTERNATIONAL PROJECT ORGANISED BY THE CULTURAL CENTRE GRATA JJ LOCATED IN LATVIA’S CAPITAL, RIGA. ON A REGULAR BASIS, IT HOSTS CREATIVE EVENTS FOR POETS AND ACTORS, ALONG WITH THE CONCERTS, LECTURES ON LITERATURE AND ART, DISCUSSIONS AND EDUCATIONAL FIELD TRIPS FOR STUDENTS AND PUBLIC ORGANISATIONS. THE WORKS OF ART SELECTED BY THE GALLERY ARE NON-STANDARD – FAR FROM BEING UNAMBIGUOUS AND OFTEN CONTROVERSIAL, LEADING TO SOME MEANINGFUL DISCUSSIONS. THE EXHIBITION HAS ABOUT 70 WORKS, EACH WORK HAVING DIFFERENT TECHNIQUES: PAINTING, SCULPTURE, GRAPHIC ARTS. FOR EXAMPLE, MYTHS AND LEGENDS THAT EXPLAIN THE REPRESENTATION OF MYTHOLOGY BY ROBERTS DINERS, BUT ALSO THAT OF THE IMAGINARY. BY USING THE ELEMENTS OF POPULAR CULTURE, FOLKLORE AND LOCAL LEGENDS, AS WELL AS THE SINGULARITY OF THEIR LANDSCAPES, THESE ARTISTS EMBRACE AN ART OF REAL ORIGINALITY. ALL THE WORKS OF ART ARE FOR SALE BOTH IN RIGA AND IN MONTREUX.